Important business decisions require a certain degree of thought and consideration. However, some CEOs tend to allow the stress produced from these decisions to overwhelm them. Does this sound familiar? 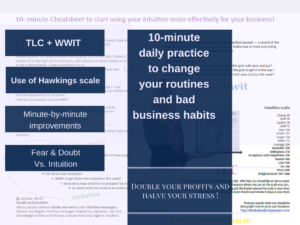 By using your intuition, the daily stress of business can be minimized. Stress and worry can be combatted through the use of an intuition building tool called “What Would It Take” or WWIT. How does WWIT Help Solve Business Problems? What are the Business Benefits of WWIT? CEOs and entrepreneurs juggle multiple tasks, face complex problems, and make important decisions daily. When under pressure, sometimes finding a clear solution can be difficult. Solely focusing on empirical data can block us from our inner creativity and lower the effectiveness of our cognitive performance. We can experience a state of “analysis paralysis” which renders us incapable of taking action. Leadership that fails to get execution working properly never has time for strategy development… Your Leadership responsibility is to make sure you are executing properly and making time to strategize your company’s decisions. A leader who doesn’t have time to make the right decisions is no better than a leader who can’t make decisions. A company without a strong leader is like a sinking ship. Failure to maintain strong leadership can bring down a company’s health and morale. Making positive decisive decisions can help keep your company on track with its goals. Asking WWIT questions can help to simplify your business dilemmas by breaking down the problem into smaller steps. WWIT to win this proposal? WWIT to attract new clients? WWIT is a great problem-solving tool that works for YOU to find solutions. WWIT questions activate your intuition and allow YOU to come up with a proper solution by focusing the problem into base steps. By increasing the amount of WWIT questions asked, you can break down a large problem into smaller easier processes. Hindsight is 20/20. WWIT questioning helps you to access this future knowledge in the present moment. WWIT is a key that opens up those parts of ourselves that we keep hidden. Once you start this journey of exploration, you may come across certain obstacles within you. Using WWIT and other tools can help address and remove these obstacles clearing the path for constructive ways forward. WWIT is a business tool which taps into our inner wisdom and unlocks greater access to our creative solutions. The WWIT question itself sets your goal. The answer provided by your intuition becomes the basis of the plan to help you achieve it. Using WWIT to achieve goals can help you do so with less stress. Stress is not a prerequisite for success. Focusing on the solution vice the struggles surrounding the problem leads to less stress. Less stress leads to a happier and healthier business environment. Expand the WWIT question to include a modifying word. This not only sets your goal, but also addresses other considerations to achieve it. WWIT to win the contract by next week? The modifier you decide to use will help focus your answer in order to achieve your desired results. Do you have any experience with WWIT questions? Comment below and share your experiences. As always, great advice is appreciated. Thanks!